but how did we get that way? The universe is a vast and sparsely populated place. Even within our galaxy things are spread out. The closest star to us is over four light years away with little else occupying the space in between. Yet that gap is not entirely empty the space between the stars, the interstellar medium, is filled with gas and dust at densities lower than the vacuums we can create on Earth. This gas and dust is mostly hydrogen and helium, some of which was left over from the big bang, but it also contains heavier elements like oxygen, carbon, and nitrogen, formed in ancient stars then spread out across space in the explosive event of their death. This gas and dust can come together under its own gravity to for slightly denser regions called giant molecular clouds that can be seen throughout our galaxy. You can even see some of them in the night sky with the naked eye. 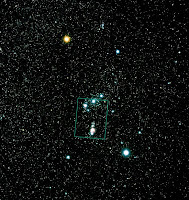 Just below the Belt of Orion on the left is Orion’s sword, where the central region is the Orion nebula. This massive molecular cloud complex is the birthplace of stars and future planetary systems and yet it is a trillion times less dense than our own atmosphere and thinner than the wispiest clouds observed on the Earth. These clouds are so cold, just 10 degrees above absolute zero, allowing the atoms to clump together into molecules. Winds and turbulence in the clouds can cause bigger clumps to form in knots. Due to the low temperatures the clumps can grow and grow, and as they acquire more mass they attract more and more clumps. 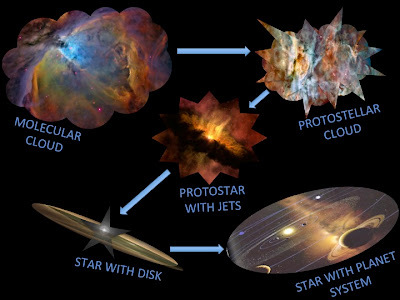 This process can take around 10 million years eventually forming a clump so large that the pressures at the center heat it up forming a proto-star at the heart of the collapsing cloud. 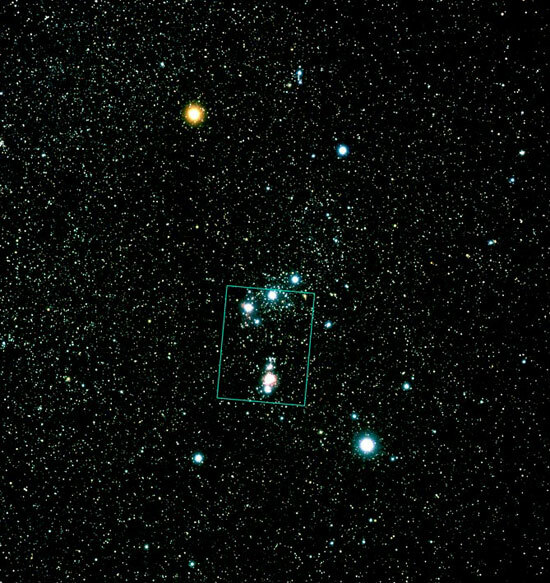 These regions are dense enough to block any optical light; millimeter and sub-millimeter observations have helped to reveal how this process occurs searching for the emission from the in-falling material that makes up the proto-star. The proto-star begins gathering more dust and gas, spinning and collapsing further. After a few million years of accretion the central mass becomes dense enough to ignite the core, fusing hydrogen into helium. Strong stellar winds erupt from the poles; blasting away the gas and dust of the surrounding cloud, halting the in fall of mass to the star. That stars fate is now sealed in the mass it managed to accumulate and is at the start of its journey along the main sequence. Surrounding the star is a disk of accreted matter that forms the proto-planetary disk. 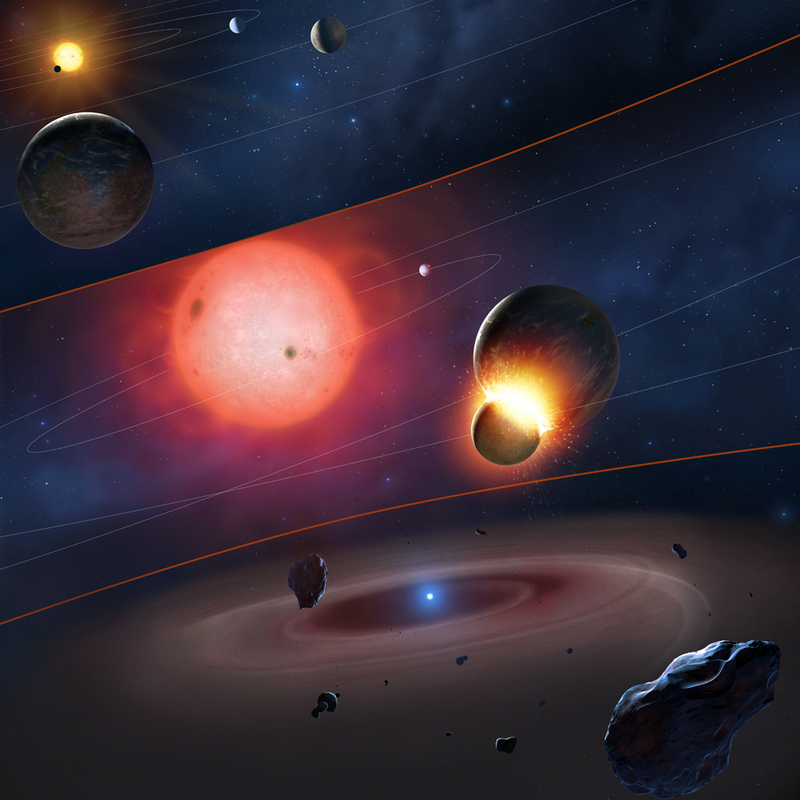 It is here that a stellar system can form and our journey from star-stuff to life can begin. The gravity of the star pulls on the particles in the disk. As they make their journey in towards the star they hit each other and in some cases join together forming grains. Over several thousand years they grow in size and mass turning into pebbles and rocks orbiting in a plane around the central star. 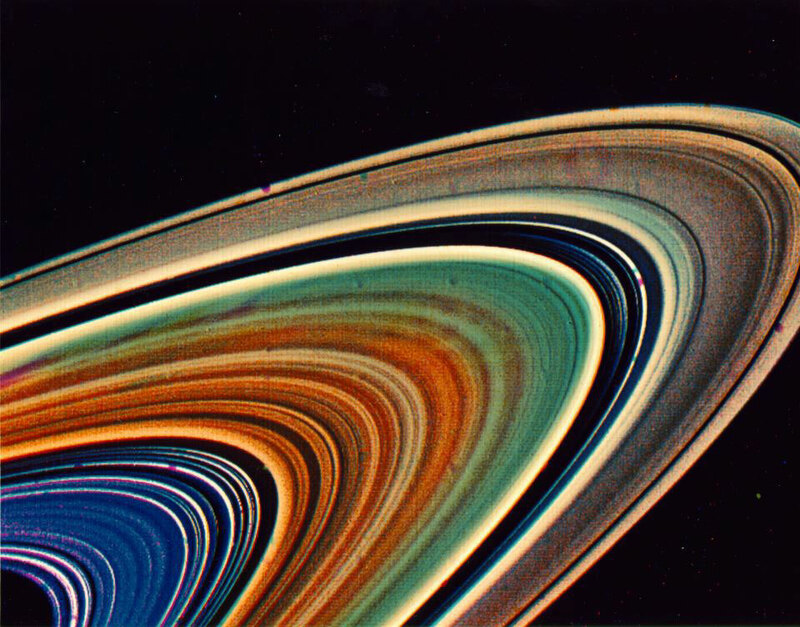 These clump into irregular objects forming bands around the star. 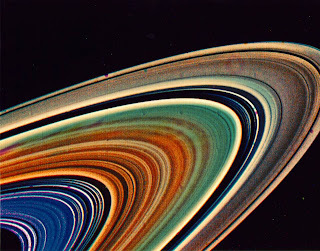 Much like the structures seen in the rings orbiting Saturn. It not until a series of violent mergers and collisions between these rocks, over millions of years, that large terrestrial worlds emerge capable of holding onto any gasses to form an atmosphere. The final fate of these strange new worlds will depend upon the temperature and type and quantity of material in the forming region. In the last few decades our theory of planet formation has been taken down and shook up. With the discovery of extra-solar giant planets in places contrary to those in our own solar system we have been forced back to the drawing board. Determining how the surrounding environment during formation impacts the resultant system is a major topic in astrophysics with many groups of scientists scratching their heads and imagining anew. So keep watching this space, reality always has a new way of surprising us. There are some great links that I found very useful so I have included them here for you to explore. What to do when your PhD supervisor is gone?